Allora, a rural town on the Dalrymple Creek, is 20 km north of Warwick and 125 km south-west of Brisbane. The area was part of the Goomburra pastoral run (1841) occupied under licence by Ernest Dalrymple. A shepherds' crossing on Dalrymple Creek became a regular stopping place, and by the mid-1840s a blacksmith's shop was opened there, later carrying stores and expanding to become an inn. A subsequent owner of Goomburra, Patrick Leslie, surrendered one square mile for a township at the crossing. Surveyed in 1859, it was named Allora, believed to be based on an Aboriginal word meaning swampy place. The roughly built Dalrymple Hotel had by then been in existence for two years. During the next decade several public institutions were opened in Allora: a court house and a National school (1867), the Wesley Chapel for Methodists and Presbyterians (1866), an Anglican church (1868) and a town hall for the Allora borough (1870). The rich black soil around Allora was ideal for agriculture, and wheat growing led to a steam flour mill opening in 1871. The court house was moved to other premises and the building was given to a school of arts in 1873. 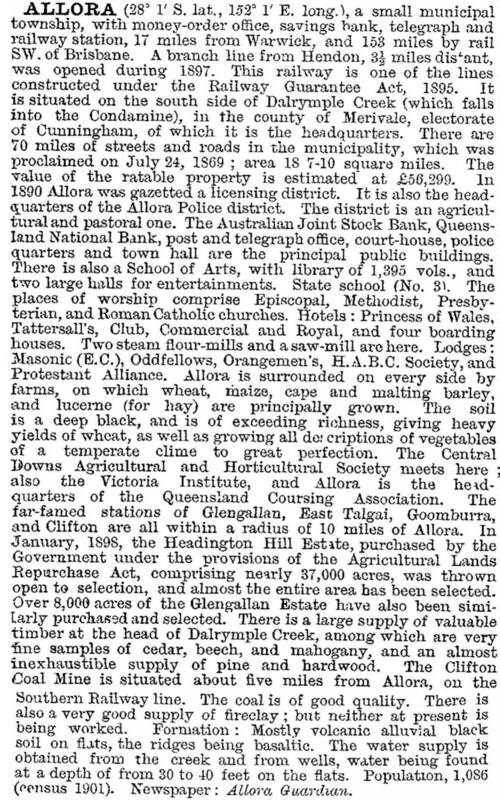 The Central Downs Agriculture and Horticulture Association had its first show in Allora in 1878. In 1905 Travers Goff was appointed manager of the Australian Joint Stock Bank in Herbert Street, Allora. His daughter, Helen, later became a successful writer under the pseudonym P.L. Travers. The old bank building in Herbert Street building is known locally as the 'Mary Poppins house', after Travers' most famous work. The Allora municipality was enlarged in 1915 with the absorption of part of neighbouring Clifton Shire. A new town hall and offices had been constructed in 1908, and continued as the Shire offices until 1960. At various times there have been five hotels in Allora, and three remain, catering to local and tourist patrons. Tourism has become important, and a town walking trail lists over 30 sites. St David's Anglican Church (1888 and listed on the Queensland heritage register) and St Patrick's Church, an elegant wooden Roman Catholic church (1898), are fine examples of timber country churches, and the old shire hall is similarly distinctive. The cemetery, a Boer War memorial and park, and Ernest Dalrymple's Talgai homestead (1868) are listed on the Queensland heritage register. The town hosts annual garden and heritage weekends, the Allora Show and the Allora Country Music Festival. Apart from the three pubs, Allora has Catholic (1916) and State P-10 schools, a local shopping centre, a recreation reserve, a showground, bowling and golf clubs, and a public hall. The railway line was closed in 1993 and the station building has been restored by a steam rail society. The Allora Regional Sports Museum contains a hall of fame, recognising, among others, the five local Gilmour brothers, all champion polo players. The town has fought an ongoing battle with grey-headed flying foxes roosting near residential areas, especially after outbreaks of lyssavirus. The town's water supply was improved by the construction of a new pipeline to Leslie Dam in 2013.